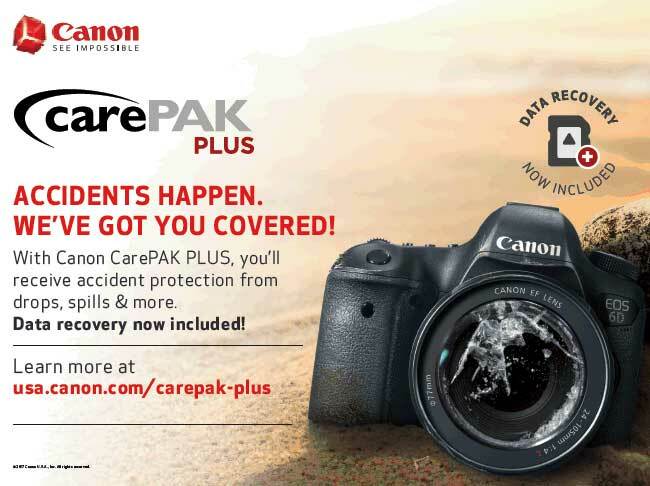 Canon CarePAK PLUS accidental damage protection plan provides up to four years of service and support from the date of purchase of Canon products—cameras, camcorders, printers, projectors and binoculars. Now the plan has expanded to include Data Recovery for cameras and camcorders that use a removable memory card, which is designed to recover lost or corrupted images and videos. The recovered files are placed on a new memory card or USB drive and returned to users. The plan also provides protection from accidental damage and additional hardware coverage for excessive wear and tear. There are no deductibles. Under CarePAK PLUS, all services are provided by Canon factory-trained technicians using only genuine Canon parts.